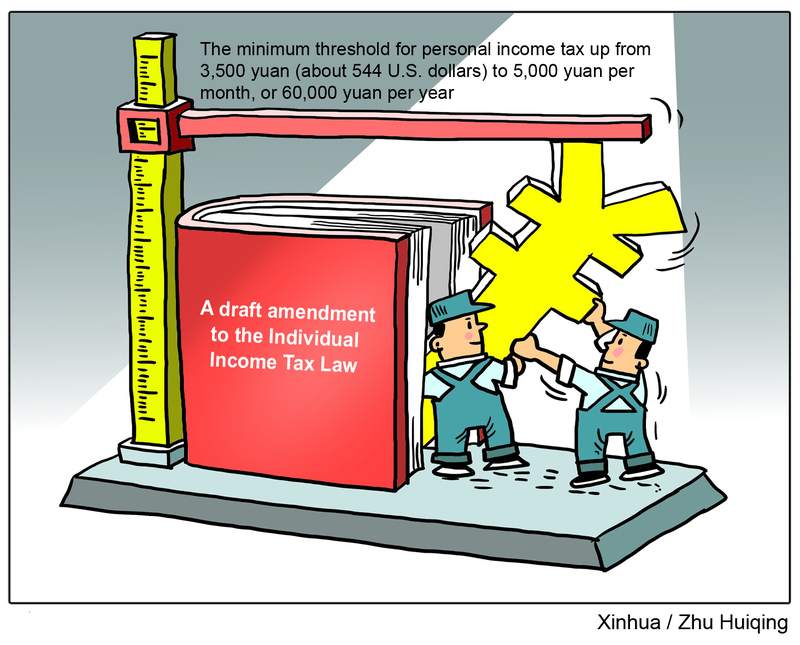 BEIJING, June 19 (Xinhua) -- China's top legislature Tuesday began reviewing a draft amendment to the Individual Income Tax Law as part of efforts in the country to achieve fairer income distribution and common prosperity. The draft amendment, submitted for the first reading at a bimonthly session of the National People's Congress (NPC) Standing Committee, raises the minimum threshold for personal income tax from 3,500 yuan (about 544 U.S. dollars) to 5,000 yuan per month, or 60,000 yuan per year. "With this year marking the 40th anniversary of reform and opening up, the revisions focus on content that is no longer suitable for China's continuing reform," Liu said, adding that the changes have taken people's rising consumption expenses into account. "This is the first time that special expense deductions have been introduced in China's individual income tax system," Liu said, adding that they adhere to the basic principles of individual income tax and are helpful for a fair taxation system. The changes are conducive to reducing tax burdens for taxpayers, raising people's income and boosting consumption. According to the draft amendment, the previous method of taxing monthly income will be replaced with a new calculation which focuses on taxing annual income. "The new method will be fairer and more reasonable for those whose monthly salary varies," said Zhang Bin, an expert from the National Academy of Economic Strategy of the Chinese Academy of Social Sciences. 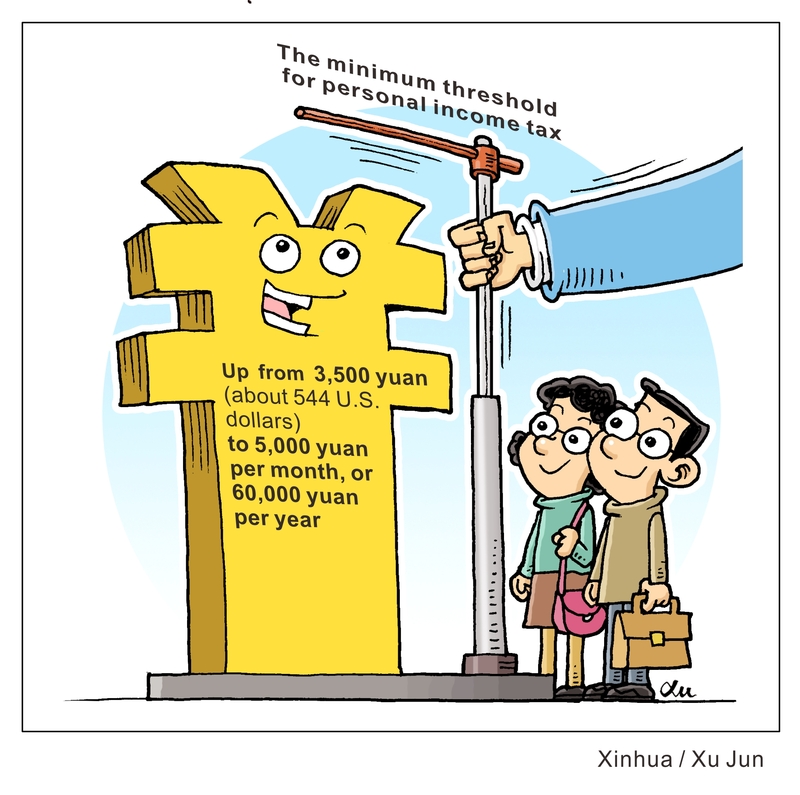 If the revisions are adopted, those whose monthly salary ranges from 5,000 yuan to 20,000 yuan will see their tax cut by over 50 percent and those whose monthly salary ranges from 20,000 to 80,000 will see their tax cut by 10 to 50 percent. 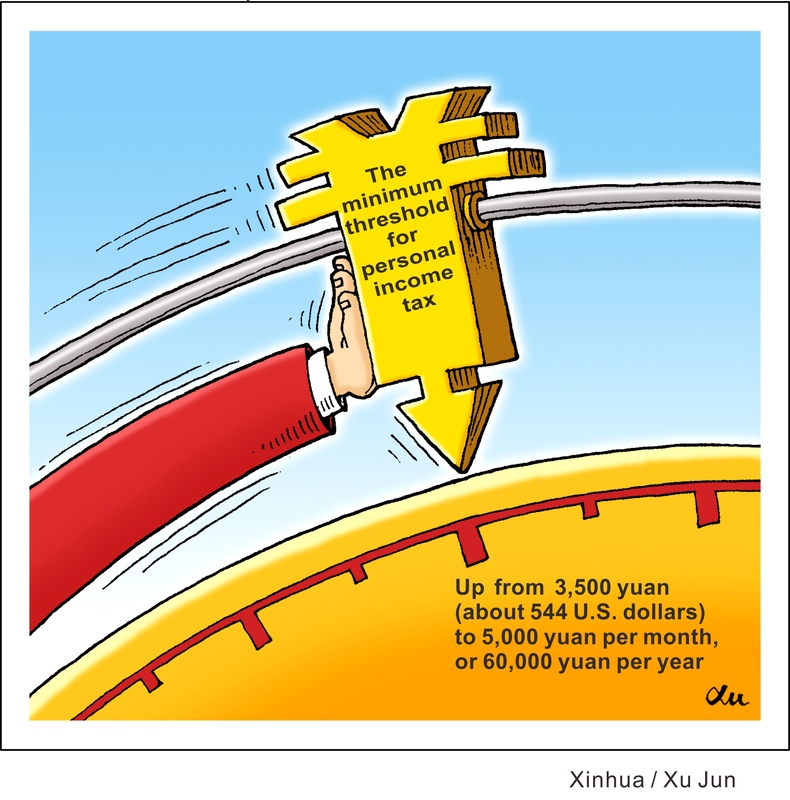 "The personal income tax reform is primarily a good news for middle to lower income groups as people with less income will see a larger tax reduction," said Li Wanfu, head of the institute of tax science of the State Administration of Taxation. The draft amendment also adds an anti-tax avoidance clause, empowering tax authorities to adjust tax rates when individuals transfer property in violation of independent trading. Individuals will also be subject to the clause when they evade taxes through overseas tax havens or obtain improper tax benefits by organizing unlawful commercial activities. "The addition of the clause is meant to let taxpayers pay their taxes in accordance with the law, which is better for the society," Li said.